Finally, small and medium scale growers have access to an affordable high quality production strain tilapia that breeds true and produces great tasting, firm white fillets. 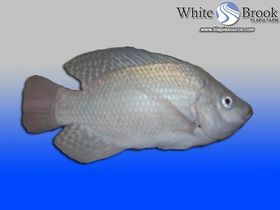 White Brook Strain White Nile Tilapia are the result of years of exhaustive selective breeding and aggressive culling. White Brooks are extremely fast growers, yet have a similar cold tolerance as Blues. Our ongoing and highly specialized breed improvement program, as well as our adherence to a very strict genetic diversity management plan means you can expect some of the highest quality stock available in the United States today. Our Tilapia are used by a local University in their ag department's aquaculture program, and we supply White Brook Niles to several commercial operations as well. You should expect to get a roughly 50/50 mix of males and females in every shipment. No artificial genetic modification (GMO FREE). Pure line, so will breed true generation after generation. We maintain numerous breeding lines within our strain as part of our Genetic Diversity Management Plan, which translates into a higher quality fish for our customers, generation after generation. Most tilapia strains available to small scale and hobbyist growers suffer from severe inbreeding due to the lack of proper genetic management. This typically leads to a slow growing fish that converts food inefficiently and is highly susceptible to disease outbreaks in high density growout tanks. These concerns are substantially reduced with the White Brook Strain thanks to our commitment to genetic diversity. White Brook Niles are capable of reaching up to 1.5 pounds in as little as 6 months of grow out time, consistently outperforming other tilapia varieties available in the US. This is a huge advantage for growers in cooler regions, allowing them to produce table ready fish in a single growing season when other strains would require extended grow out times. White Brooks have exceptional consumer appeal due to their white flaky meat as well as their exotic appearance when sold live or whole on ice. Our customers who sell live fish at fresh fish markets and farmers markets consistently report back to us that their fish command higher live weight prices than competitors who offer "standard" color tilapia varieties.